An Opticstar PL-130M, monochrome, 1280 x 1024 CMOS camera was fitted with two ND13 filters to bring the light levels within the sensitivity range of the sensor. 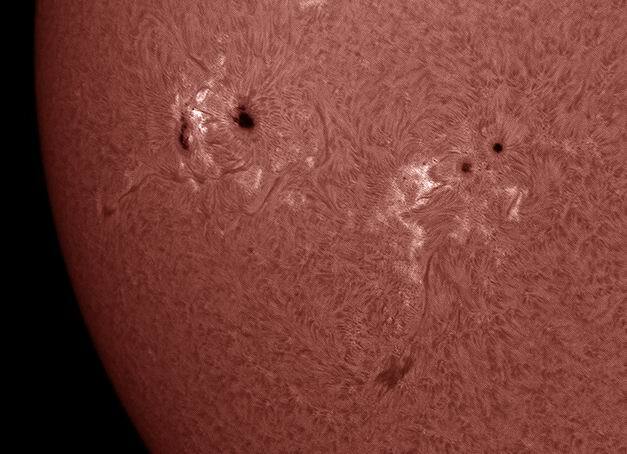 The camera has a 1/2" sensor, so, when placed at the prime focus of a Solarmax ll 60 BF15 H-alpha scope, the image of the entire disk falls on the chip. The camera was set to capture 5 minutes of AVI at 8fps. The data were stacked in Registax to produce the final image which has been colourised to represent the wavelength of light being used.